Lawrence Ferlinghetti (born March 24, 1919) is a poet who is best known as the co-owner of the City Lights Bookstore and publishing house, which published early literary works of the Beat Generation, including Jack Kerouac, Kenneth Rexroth and Allen Ginsberg. 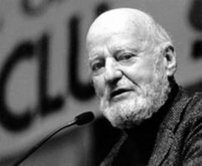 Ferlinghetti was born of an Italian-Portuguese-Sephardic immigrant family in Yonkers, New York, he attended the University of North Carolina at Chapel Hill, and then served in the United States Navy during World War II. After the war, he got a master’s degree from Columbia University and a doctorate from the Sorbonne. While studying in Paris, he met Kenneth Rexroth, who later persuaded him to go to San Francisco to experience the growing literary scene there. Between 1951 and 1953 he taught French, wrote literary criticism, and painted. In 1953, Ferlinghetti and Peter D. Martin started a bookshop, which they named City Lights after a film magazine Martin had started. Two years later, after Martin had left for New York, Ferlinghetti started the publishing house, specialising in poetry. The most famous publication was Howl, the poem by Allen Ginsberg, which was initially impounded by the authorities, and subject of a groundbreaking legal case. Ferlinghetti’s best-known collection of poetry is A Coney Island of the Mind, which has been translated into nine languages. In 1998 he was named Poet Laureate of San Francisco. In addition to writing and publishing poetry and running the bookstore, Ferlinghetti continues to paint, and his work has been exhibited in galleries and museums. how will we drive in twenty five years? how will we fly to the east? for half the population is obese. in hundreds of thousands of years will America be discovered again? will gold, god, and glory be the basis for exploration? will history repeat itself completely obliviously? Or is it possible for human nature not to exist? I am a prophet and I know better. The water, the writer or the written word? Behind…the silence of Depression years. When begging bread and drowning in our tears. “America…I see you dying” said the prophet. Tell me…show me…that it isn’t true. Will you pass this crisis to see another dawn? I hope…I pray within me that you do. Do you have any comments, criticism, paraphrasis or analysis of this poem that you feel would assist other visitors in understanding the meaning or the theme of this poem by Lawrence Ferlinghetti better? If accepted, your analysis will be added to this page of American Poems. Together we can build a wealth of information, but it will take some discipline and determination.